Q) Relatively-speaking, you began your career as an author somewhat late in your life compared to many others, with your first published work dating back to 2010, a joint effort between you and other writers titled Writing in a Changing World. Have you always had a love affair of sorts with literature, or did that end up developing over time? Who would you say are the authors who left their mark on your style the most, and why? This is quite a loaded question—it covers several subjects in a few questions. Actually, to set the record straight, I’ve been writing all of my life—mostly poetry. I’ve had scores of individual poems published before composing and constructing my first complete poetry collection, Cooking Lessons, which was published by a small, independent publisher, Rock Press, in 2007. I then went on to publish several more poetry collections with other small, independent publishers. The second collection was Coffeehouse Meditations, in 2009 with Kitsune Books. So I had two poetry collections published before the collaborative, nonfiction book. My third poetry collection, She Wouldn’t Sing at My Wedding, was published with Bridle Path Press. The fourth collection was Faraway Confections, published by Aldrich Press, and the fifth one, Westward: Guided by Starfalls and Moonbows, was published by Red Dashboard, LLC. I also have two poetry chapbooks, Prayer in a Summer of Grace and Time’s Mirrored Illusion published by Flutter Press—sadly, I heard they are closing their doors. It was a great little venue. In 2010, I was in a writing group called: “Screw Iowa!” We had met in 2004 in a summer seminar at the famed Iowa Workshop. We tried to invent a course geared to our needs the following summer, but since our proposal was turned down, we bonded together, said, “Screw Iowa, we’ll do it ourselves.” We did. We started reading and critiquing each other’s complete novel manuscripts, and in my case, the other members also read my poetry manuscripts. We compiled a book on writing using our method and model of a writing group, and published this nonfiction book, Writing in a Changing World. As to my list of authors, it can go on for pages, because the listing includes poets as well as fiction writers. I’ll just name a few of them—not so much for their influence on my writing style but because I admire their works and have found in them sources of great inspiration. Here they are in no particular order: Leo Tolstoy, Thomas Hardy, John Donne, Fyodor Dostoyevsky, Anton Chekhov, Rudyard Kippling, Samuel Taylor Coleridge, Herman Melville, Walt Whitman, (amazing I never read him until Grad school! ), Jane Austen, John Steinbeck (although he’s not a favorite in the literary cannon—I read every one of his novels, except Viva Zapata, and I believe that was a screenplay!) Elizabeth Bishop, Isabel Allende, Cormac McCarthy, Larry McMurtry, Charles Frazier, E. Annie Proulx, Alice Munro, Diane Ackerman, Yeuda Amichai, Philip Larkin, John Ashbery, C. K. Williams, Marie Howe, Mary Oliver, Campbell Mc Grath, Michael Hettich, John Dufresne, Jim Daniels, Denise Duhamel, Sarah Cabot Gunning, and the list goes on and on! Q) Co-authoring a book with one other person seems like a complex yet manageable affair. For your first book, you cooperated with four other writers to make a single cohesive work. What sorts of challenges did this “plan of operation” present? How did you all manage to make it work in the end? As I said above, Writing in a Changing World this wasn’t my first book. The group had also written together before this book, however, it was more in the style of personal essays and on writing by each of us. We decided that this would be interesting perhaps once our careers were established, but for the meantime, we needed to publish a collaborative effort on writing in today’s changing world of writing and publishing. So that’s what we did. Was it difficult? Not really. We would email pieces to each other for critique and rewrite when necessary. We loved the use of quotes that my friend and mentor John Dufresne placed in his first book of writing, The Lie that Tells a Truth, so we incorporated that as part of the style. I asked and secured blurbs from John Dufresne and Tom De Marchi, director of the Sanibel Writing Conference, and we were done in a year’s time! Q) You continued your published writing career with poetry collections, including The Other Side of the Gates and Coffeehouse Meditations. It seems each and every person has their own individual relationship with poetry; does it hold any special significance in your life? Was there something in particular which gave you the desire to write those collections? The Other Side of the Gates is a collection of short stories—most of these were written in Grad school at FIU as part of my MFA thesis. I spoke about the poetry collections previously, but I’ll happily speak to you about my relationship with poetry. I think that my fiction works because I am first and foremost a poet and I write lyrically. Poetry has gifted me a knowledge-filled tool book to draw from while I’m devising fiction. This personal workbook that I cull from, includes the use of elevated language, especially strong nouns and verbs, metaphor, imagistic writing, a sense of rhythm, cadence and balance, the skill of repetition and of line breaks, and even narration. In my fiction you’ll notice the variation and different lengths of my sentences—garnered by knowing where a line break should come in poetic form. I had many, many individual poems published in various literary journals and magazines—online and in print—before putting together my first collection. What I learned from Campbell Mc Grath, a phenomenal poet, is how to assemble a collection—the importance of theme and juxtaposing and harmonizing already published poems with new work. I didn’t want to be pigeon-holed as only a fiction-writer in Grad school, so I took five poetry courses with this master, although we write nothing alike—he writes about pop culture, among other things, and I write elegiacally and lyrically. What I also learned from Campbell is one of the key elements to writing poetry, which is to hone in on the energy of the poem, develop and revise from that point. What’s beautiful about this skill is that is translates as carry-over to fiction writing. The last part of this question: “Was there something in particular which gave you the desire to write those collections?” I’d have to say, yes in two particular instances. The narrative, elegiac collection I wrote for my mother—She Wouldn’t Sing at My Wedding - and the poems of the West that I wrote for my brother in the collection, Westward: Guided by Starfalls and Moonbows. Q) What exactly inspired you to leave the beaten path of poetry and try your hand at writing a novel? What were some of the unexpected difficulties you encountered along the way? Which of the two types of writing do you find more enjoyable? I always wanted to become a novelist. I consider poetry a gift from the Almighty - it’s a given in my life. 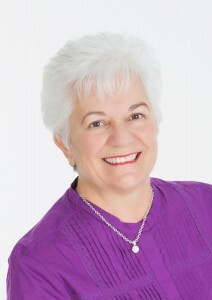 I struggled with prose and wrote many short stories before I ventured into the novel. One of the most difficult aspects of fiction-writing for me is plotting. I don’t outline, so the story grows organically from the characters—their wants, needs and motivations. One of the difficulties I encountered was hiring an literary agent. 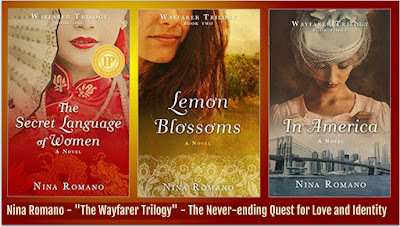 It took me eighty-four letters before I hooked one, and then she was never able to place my novel, Lemon Blossoms, so I decided to take it back and write the prequel, hoping to make it a trilogy. I then wrote The Secret Language of Women, wrote diligently to the agent, who never responded. That’s when I decided to send my manuscript to small independents. I queried three of them and was accepted by Turner Publishing in a week. Done deal. Q) Having seen the evolution of the book industry in the past couple of decades, do you feel you would have found the same level of success had your works been published before the advent of the digital age and online books? “Hindsight is twenty-twenty vision,” or so they say. I’m guessing that if I’d gotten into the publishing game earlier, I would have found it much easier to publicize, market and find an audience, but we can never really know that, can we? Q) In a more general sense, how do you feel about the new wave of self-published authors who can now easily distribute their books in virtual format without any help? Do you believe there is the danger it will lower the overall writing quality of new books as authors will prefer to edit their own work and not have to deal with the discomfort of rejection? Or perhaps it will help shine the light on talented writers who would have otherwise remained under the radar? I’ve read far too many self-published books that are appalling simply because they didn’t have the text edited. Of course, one cannot generalize. There are many decent authors who are self-publishing for one reason or other. These people are historians, researchers, writers with college degrees, authors who study, read and produce very fine books, and for whatever reason, weren’t able to hook and agent and hence, a big publisher. These more serious writers show pride in their work because they edit and revise their manuscripts before attempting to publish. Or they work with a professional editor. However, there’s a glut of published books. Amazon is overflowing with far too many print and E-books that are poorly written. This, indeed, is a sad state of affairs for the industry and makes it even more difficult to market viable reading material. The difficulty is how do you discern, discriminate or recognize the works of value? Cover images? Back cover text? Sometimes blurbs by other authors help cut the wheat from the chaff. Recognition, commendation, and endorsements from other authors are helpful indicators when choosing a novel. Q) The Secret Language of Women deals, in large part at least, with a very particular microcosm of Chinese history, that of the Boxer Rebellion and Nushu. What exactly made you choose this very specific topic? Did you have any former familiarity or education on the subject? I’ll sum it up for you in two words: my Grandfather. My Grandpa fought in the Boxer Rebellion in China. He was in the Italian Navy and as sailor patrolled the waterways of China. His exotic tales of China were fascinating. His stories resonated with me even more as I grew older. I learned about Nushu after I graduated FIU when I published a short story entitled, “The Rain,” which was published in the print edition of Dim Sum, Hong Kong’s Literary Journal. I believe it’s now called: Dim Sum Short Story Magazine. Also when I was young, I read novels by Pearl S. Buck, and the true story: The Inn of the Sixth Happiness by Gladys Aylward. I knew from the time I was young that I wanted to travel to China and I’ve been blessed in the fact that I’m married to a world traveler. Because of this, I was able to visit China and Asia many times. The first time I went there was over twenty years ago, and I remember taking notes so that I could write about what I saw at a later time. Q) When it comes to writing a novel in a historical context, there is always the question as to how one should strike the balance between facts and entertainment. Did you find this caused you any problems while writing your books? How exactly do you go about determining what the proper ratio would be? Did your technique for doing so change from one book to the next? I try to use real and true facts in all of the background material for my historical writing. I do this with a great deal of careful research concerning the time period I’m writing about. In my case, it helps that I’ve been to China, lived in Italy and New York—the settings for my three novels of the Wayfarer Trilogy. I'm unsure as to what you mean by the word entertainment. If you are referring to the fictitious story, then for me, I rely more on story than research. I try to get the facts straight for contextual material and chronicle the storyline during the time period I’ve chosen. My so called “technique,” whatever that is, certainly never varies or changes. I explore in order to build a story in the age I’m interested in, delving into all the material I find that is a propos for that particular era. History, geography, culture, politics, superstitions, and fashion tastes change, but people are people in whatever epoch, and I delve deeply into the psyche and emotions of the characters I write about. Q) In the third book of the Wayfarer Trilogy, In America, it was my impression the romance aspect was very much dialed down compared to the previous entries in the series. How prominent do you feel a love story should be in a romance novel? Can it even survive on its own without supporting elements? Do you think readers might feel cheated if it took a back-seat to other aspects? I don’t feel that I “dialed down” the third book in the series. I was under contract with Turner Publishing and had to write the book in one year. Given more time, perhaps I could’ve ratcheted up and intensified the story, but I enjoyed the love angle to this particular novel. 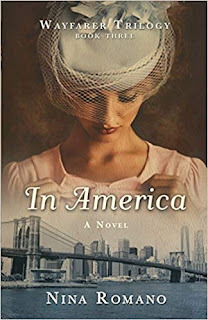 It’s set in a different era and in New York—the music, the dress and hair styles were so much zippier, that I felt a change of pace and a deeper plunge into more romance would be appropriate. The prominence of love in every romance should be apparent, but I don’t feel it can survive well on its own without a strong supporting cast and a solid storyline. There are many types of love and these more platonic or familial attachments are also important and shouldn’t be overlooked in the romance novel as far as I’m concerned. Place and setting are indispensable to my writing—to the point of almost becoming characters in my novels. I’m uncertain whether or not readers would feel cheated if the love story was of lesser importance in a romance. Romance to me means so many different things - allure, excitement, adventure, nostalgia, besides passion. There are many varied ways to approach writing a romance novel - give a reader a compelling story and strong characters to follow for a few hundred pages, and I don’t think they’ll feel let down if the “love angle” is attenuated. Q) The main characters you create, particularly Giacomo, are always detailed in an extremely profound fashion, to the point where it feels as if you're reading an actual biography. Can you talk about your process for creating them? How much do you borrow from the people you know and your own life experiences versus your imagination? As a result, do you end up creating particular attachments to them? Oh dear! All of my characters are based on people I know—they are usually composite figures. I steal mannerisms, attributes, failings, flaws, and positive traits from everyone, and then I invent a personage into which I meld and mold whatever I need or want, like Giacomo. I’ll give you an example, but not Giacomo, because he’s much too close to my heart. I’ll tell you instead about Lian’s sage, Zhugong. I fell in love with him. He’s wise, funny, and has such an incredibly interesting life up until the time Lian meets him. The more I wrote about him, the more I wanted to know—I was on the verge of becoming obsessed with everything about him. Who is he? Where did he come from? What was his life like? His desires? Sufferings? He’s one of the most venerable, obstinate, cantankerous, loveable men ever, and I swear I don’t know how he came to me, except he did and I’m so grateful. I had a wooden pig I’d brought from China on my desk at the time of writing him into the story. Zhugong is the pig-keeper, and I’ll cherish his memory always. Q) The way in which you establish context and setting through exposition in your novels always manages to create powerful, evocative, precise and memorable images. Is there any advice you can offer to aspiring authors looking to reach this sort of technical proficiency? Do you follow any particular rules yourself? I enjoy writing scenes the most because they are dynamic and contain action and dialogue, which propels the story forward. However, if I have to write information into narrative exposition, I tend to make it scenic. I use lessons from poetry, and employ images, metaphor, strong verbs and nouns—anything and everything that’ll help me paint a vivid picture for the reader. Q) What can we expect from your next book? Will you stick to the same genre or perhaps venture to explore different horizons? Are there perhaps other historical settings you are looking forward to exploring? My next novel, The Girl Who Loved Cayo Bradley, is a Western Historical Romance, which will be released in 2019. It’s set in the 1870’s in New Mexico and St. Louis, Missouri. I thoroughly enjoyed doing the research for this novel. I’m completely enthralled with history, geography, culture and beliefs of the Jicarilla Apache, cowboy life-style, roping, riding, lassoing cattle to brand—all of the lure and romance of the west. Some consider this genre - I hope this novel raises the stakes by writing a literary tale in poetic fashion. Currently my WIP is an historical romance. The story is set in Leningrad 1956, which is right after the Stalin era and WWII. I absolutely fell in love with Russia and St. Petersburg, long before I ever travelled there. I knew I’d visit and write about it since I was a little girl and my father nicknamed me Ninotchka. I must say, I’ve always been intrigued with Russia, and that’s probably in great part due to my fondness for their literature.